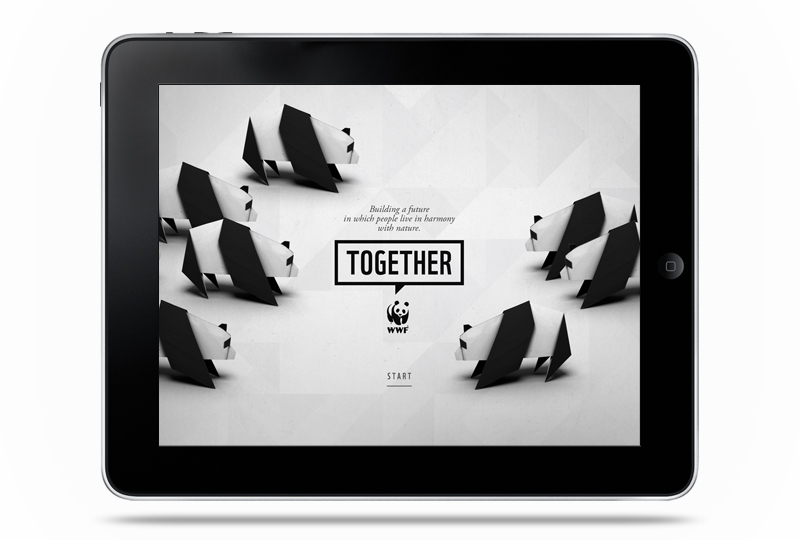 Lovely new iPad app by Studio AKQA for the WWF (That’s World Wildlife Fund, not the wrestling…). Through the app you can explore information, videos and images on some of the worlds rarest animals. It’s launched with Giant Pandas, Marine Turtles, Elephants, Tigers, Bison, Polar Bears, Snow Leopards and Whales. With Rhinos, Gorillas, Sharks and Jaguars to come in future updates. The element I really like about the app is the theme of Origami that runs through it. From the opening Panda through to globes, the background and even downloadable instructions on how to make each featured animal. It holds all the species together in a familiar structure while keeping a personal, friendly aesthetic for what is, essentially, a very serious subject. As far as the usability goes it feels nice and intuitive, has clear calls to action and even embraces iPad’s inbuilt features (in the Polar Bear area there’s a section to tilt the screen and keep a ball balanced to reveal a fact). It’s not groundbreaking in the feature front, but the app is about information and clarity, which it does exceptionally. Burberry’s SS13 Beauty Campaign is Live! The Burberry Beauty experiences I designed while freelancing for them have gone live! Designed to showcase the hero image on the left hand side by keeping it fixed to the device height, while allowing different amounts of supporting content through the scrollable, flexible grid on the right it caters for product, stills and video. The flexible grid section makes it adaptable for iPad to super-wide screen, while also giving the content a structured but editorial feel. Burberry’s Spring Summer 2013 Campaign is Live! The first Main Campaign I’ve worked on while freelancing for Burberry, their Spring Summer 2013 campaign is now live! Shot by Mario Testino, and featuring Romeo Beckham in his ad campaign debut, alongside Burberry staples Edie Campbell and Cara Delevingne, it’s a much brighter campaign than they’ve opted for in recent years. 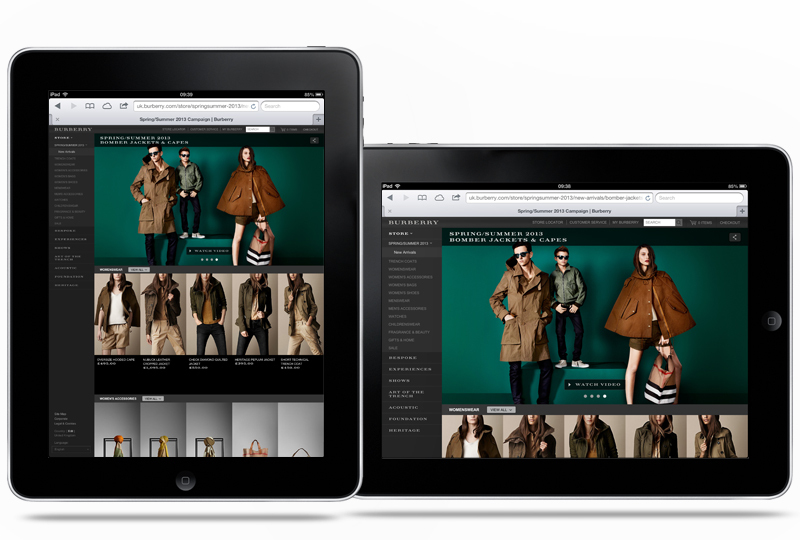 Because of this we wanted to keep the design of how the campaign would sit within Burberry.com as clean as possible, while including the necessary functionality. The two main areas that needed to be considered were how to make this campaign more overtly shoppable, and how to display the videos that accompany some of the still shots. Following on from the Festive campaign it was decided that this would also sit inside a store page. The main addition here was adding in a sliding ‘Shop Campaign’/’Explore Campaign’ button which allows you to switch the pages focus from browsing the campaign stills and videos or browsing related product. For the video display options, to avoid duplicating content within the carousel (as each video supports an image), we decided to have a ‘watch video’ button instead which fades the image down to its accompanying video, and returns to the carousel at the end. Resulting in a much cleaner experience than an overlay or other similar options. Overall I think the experience does what it set out to pretty well, which is allow the imagery to take precedence over the interface. Alexandra Leavey’s site upgrade is live! The updated (and much upgraded) version of fashion, advertising and editorial prop/set designer Alexandra Leavey’s site is now live. Built to work perfectly on desktop, tablet and mobile it can now be viewed wherever her clients are, and on their device of choice. Comprising of swipe, keyboard and mouse controlled navigation I built it to be as accessible as possible, while keeping the design and interface minimal so her images are the focus. 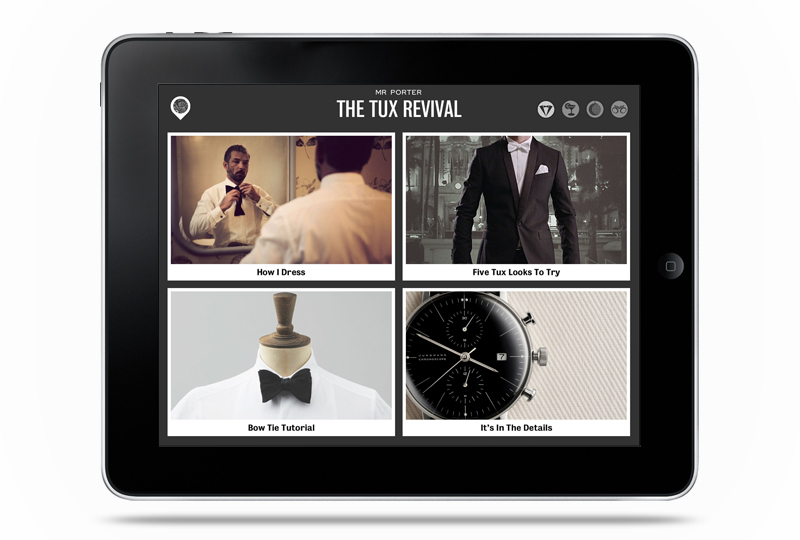 My two favourite elements of this app, which were what made me decide to write about it, are the Bow Tie Tutorial and the It’s In The Details, both pictured above. The Bow Tie Tutorial talks you through tying a virtual bow tie using drag and swipe to follow prompts. It’s such a simple way to explain it (especially as I didn’t know how before), and it really takes advantage of the iPad’s touch screen to get the user interacting and involved with the content. In the It’s In The Details section they’ve showcased a selection of products, nothing new there eh? The difference is that each one utilises it’s own type of interactivity. Whether it be using the accelerometer to tilt cufflinks for a better view, the touch screen to stroke fabric or (my personal favourite) the camera of the iPad to display reflections on the face of a watch. Combined with some nice, and pretty varied, videos and animations the whole app is just fun to play with, and for those with heavier wallets, quite easy to shop from. Might as well, it’s free after all! 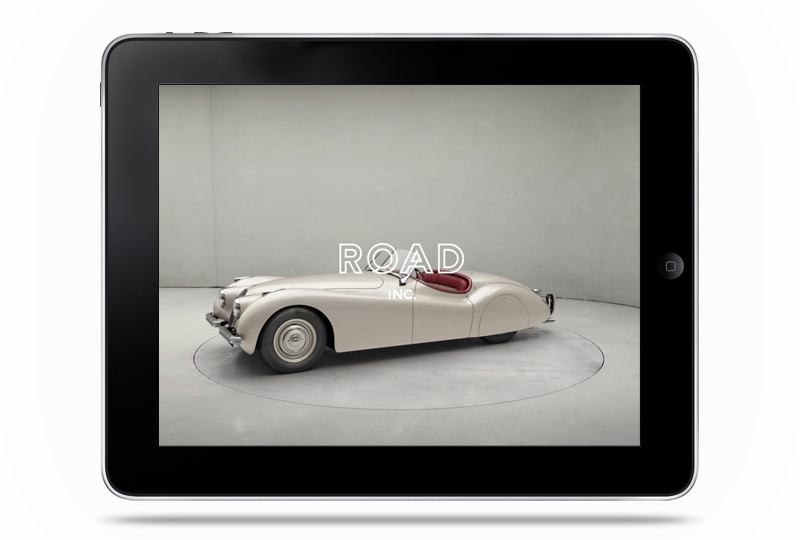 I think Road Inc has to be one of the prettiest and most enjoyable to use Apps out there. As someone who knows nothing about cars (and has very little interest in them) I was surprised by how much I like playing with it. The 3D rotatable models, extremely clean and intuitive navigation and beautiful imagery make the whole experience a joy. Had it been designed for desktop, or even mobile, it wouldn’t have worked. 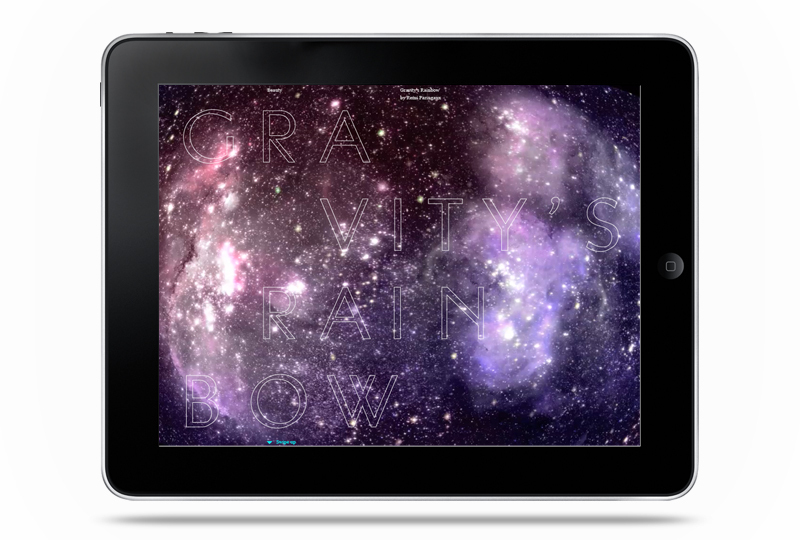 It being for iPad suits the more laid back browsing style and is what makes it so successful. If you have a spare half hour (which may turn into longer once you start unveiling more models…) download it and take a look. Well worth every penny. 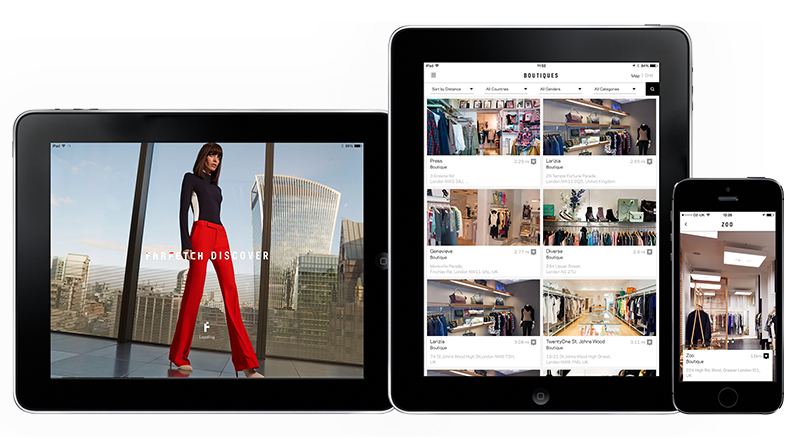 Introducing The Britain (to quote the campaign..), the first multi-platform ‘experience’ I’ve designed while freelancing at Burberry! Designed as a form of micro-site within the main Burberry.com site, it’s purpose is to promote their new range of watches. With mobile and tablet visitors to the site increasing daily it was a necessity for it to work across all devices, and I think the result does that pretty well! It has a separate mobile version, with a crystallisation of content (as well as some nice mobile specific features), and a responsive version for desktop and both tablet aspects. Some nifty (or “whizzy”, as The Guardian called them…) features include a real time and real weather watch on mobile, and 360 rotatable and exploding 3D versions of the hero watch on desktop/tablet. I especially like the interactive beauty shoot, with the twinkling galaxy reflecting off the visors, which through hiding the product from initial view built a nice intrigue before the user unveils them. Other nice features are the interactive 3D models in the ‘Inner Space’ Shoot, as well as the skydiving models in the ‘The Man Who Fell To Earth’ shoot. Overall some really nice concepts, and all pretty slickly executed. I look forward to seeing what they come up with in their next edition!